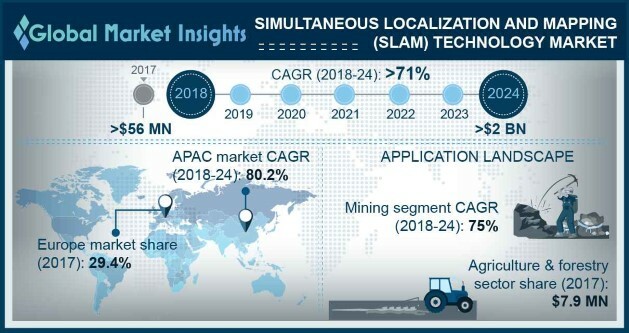 Simultaneous Localization and Mapping (SLAM) Technology Market size is set to exceed USD 2 billion by 2024; according to a new research report by Global Market Insights, Inc. The rising technological developments and growing awareness regarding the benefits offered by the SLAM technology are primarily driving the market demand. Over the past five years, leading technology companies, such as Google, Facebook, and Amazon, have made significant investments in SLAM technology to indulge into various business expansion strategies such as new product developments and mergers & acquisitions. For instance, in 2015, Apple acquired an AR company, Metaio, after the company announced a SLAM capability in its Software Development Kit (SDK). This acquisition has assisted Apple to include Metaio’s technical SLAM base into its product, ARkit, an AR framework for developers. Numerous mapping technologies, such as marker-based tracking and GPS, are used in various sectors including military, agriculture & forestry, and other commercial sectors. However, these technologies do not work efficiently indoors and even in certain outdoor locations that lack a clear view of the sky. To overcome these drawbacks, companies are now adopting the SLAM technology that works efficiently indoors as well as in urban environments and provides high accuracy. The SLAM technology uses various types of sensors including tactile sensors, image sensors, and LiDAR to develop a map of a space along with determining the location of the device within that space. The other benefits offered by the SLAM technology include easy navigation without reliance on external technologies and real-time formation of 3D maps with reduced cost & power requirements, driving its market growth. The prominence of mapping technologies in domestic service robots is growing rapidly as these robots can move smoothly across the tighter and denser spaces in the house. The growing standard of living, rising urbanization, increase in the disposable income, and the aging population are the leading factors enhancing the adoption of domestic robots especially in urban areas. There has been a substantial growth in the demand for domestic robots with around five million units shipped in 2015, which is projected to cross approximately 11.5 million units by 2020. The traditional robots witnessed the issue of navigation especially in the unknown environment, resulting in the robots bumping into the house walls. Therefore, the inclusion of SLAM for navigation and obstacle avoidance in domestic robots is evolving rapidly. Various companies operating in this segment have launched SLAM-based domestic robots to carry out household chores efficiently with cost effectivity. For instance, in 2014, Neato Robotics, a robotics company in the U.S., launched Neato Botvac, a home robot vacuum. This intelligent robot makes use of SLAM technology to navigate the house for cleaning floors. The company makes this product available to the customers at affordable prices, increasing its adoption rate. The 3D motion segment is projected to grow at the fastest rate over the forecast timespan. The 3D technology is rapidly being adopted by various applications including AR, UAV, and robotics. With an increase in the adoption of handheld devices, the Handheld Augmented Reality (HAR) introduces AR to numerous consumers. These devices lack the potential to get the precise 3D positioning of the objects as they are unable to correctly map the 3D environment. The usage of SLAM enables exact 3D positioning of virtual objects to the actual environment with improved efficiency and reduced time, accelerating its demand in the market. The autonomous vehicles segment is anticipated to grow at the fastest rate over the forecast period. Autonomous driving involves various critical tasks, such as navigation, planning, and collision avoidance, which cannot be fulfilled by sparse map representations. To obtain dense maps, SLAM technology has been used to produce highly accurate maps. Google’s driverless cars employ the SLAM technology that uses roof-mounted LiDAR sensors for creating a 3D map of their surroundings. This is done by the system within 10 seconds as a quick response is necessary since the machine being tracked is moving with high speed and acceleration. These mappings are then augmented over the existing Google maps. With the aid of these readings, the autonomous system makes important driving decisions using the statistical probabilistic algorithms, creating a more enhanced autonomous driving experience. The commercial sector dominates the global SLAM technology market with an industry revenue of USD 22.2 million in 2017 anticipated to reach USD 933.4 million by 2024. Various industries using the SLAM technology include healthcare, hospitality, construction, service, education, automotive, retail, and wholesale departments. The healthcare department requires image guidance systems for performing critical surgeries. These systems must be capable of displaying a detailed computer-based 3D visualization that enables the surgeon to rotate the 3D model on the computer for gaining an enhanced understanding of the location of the robot with respect to the anatomical target. The existing image guidance systems have limited functionality with certain restraints, such as inaccuracy and inefficiency, to convey all the available information. The adoption of SLAM technology in the medical systems enhances their accuracy in estimating dynamic information and gives precise inferences of deformation during surgeries. North America dominates the global SLAM technology market with an industry share of 50.5% in 2017. The major factor contributing to the growth include the presence of several drone manufacturers in this region. Being home to some of the leading SLAM solution providers including Apple and Google, the region is presenting new growth prospects for advanced adoption of the SLAM technology. The companies functioning in this region are also involved in new product development strategies for expanding their presence in the highly lucrative market. For instance, in April 2018, AI Incorporated, a leading Canadian AI and robotics research firm, launched the design of the mobile autonomous robot, a new application for mobile robotics. This innovation will render humans from emptying trash bins as the bins will automatically leave their place to be emptied during their pickup time. These robots use the SLAM technology to avoid obstacles and automatically navigate toward the truck on its arrival. Market expansion and new product developments are the main strategies adopted by the enterprises operating in the SLAM technology market. The prominent companies functioning in the industry include Google, Facebook, Apple, Parrot SA, Kuka AG, Microsoft Corporation, SMP Robotics, Wikitude, GeoSLAM Ltd., Kudan, Clearpath Robotics, Inc., DIBOTICS, Aethon, Fetch Robotics, Ascending Technologies GmbH and NavVis.